Do you work on or near ice? Drive over ice roads to get to work or to go ice fishing, hunting, sledding, or skiing? Are you a rescue professional (SAR, military, fire rescue, etc)? Then you need this training. Many of BC’s resource workers (in the fields of forestry, mining explorations, and fisheries, as well as biologists, road and bridge construction workers, engineers, and others) find themselves working near river or lake ice environments. 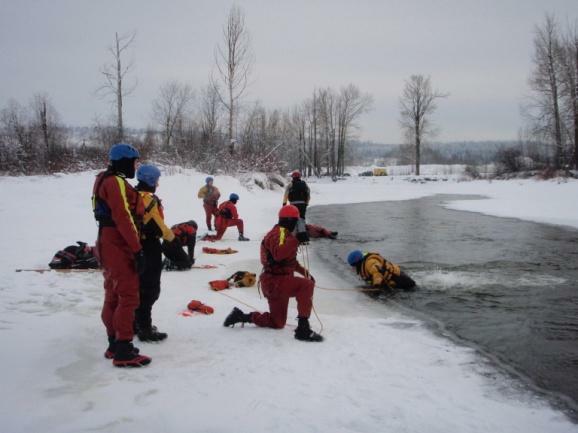 Courses designed to provide resource professionals with the most current information on preparation, mitigation, self-rescue and safety concerns for personnel dealing with ice survival training and job safety in general. During the practical course components, participants will be suited up and literally immersed in the ice environment – practicing self rescue and team rescue, as well as learning safe approaches to carrying out their job requirements. work in small teams, unsupervised. Courses are tailored to the needs, work environments, and job duties of the students. We can also discuss options for different course delivery models and course lengths. To check out dates and to register click here. Don't forget to check out other calendar months for other available dates too. Dedicated rescue personnel need courses specifically designed for their applications. 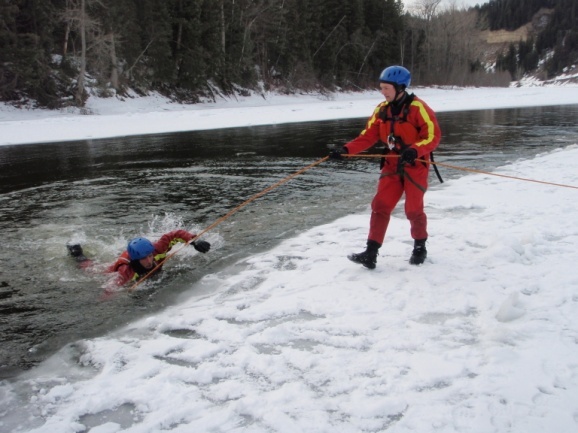 These courses are focused on search, rescue, and recovery techniques from low to high risk, covering 7 key modules of skill and performance in the ice environment. Each level of course is based upon environmental risk, rescue mandate and equipment needs. Contact Lauren at OVERhang to explore the appropriate course level for you and your group, based on your mandate, operational tasks, and environmental risks.